Today I am going to share with you my strategy on how to CASE a card. So a couple of weeks ago, one of my downlines and I challenged each other to make a card with the Stampin’ Up! 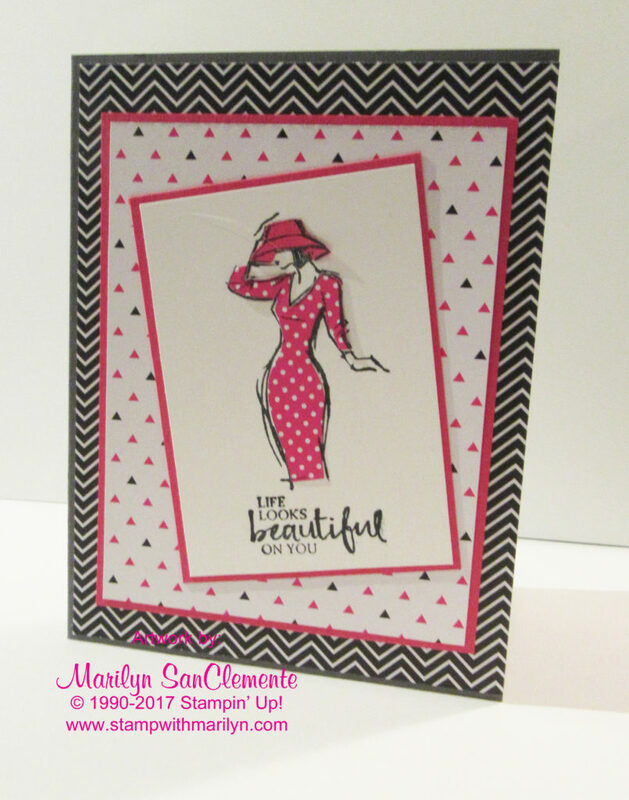 Beautiful You stamp set and the Pop of Pink Designer Series paper. This is the card that Jeanne made. 2. Next Layer: Melon Mambo card stock cut to 4 7/8″ x 3 5/8″ layered with a piece of 4 3/4″ x 3 1/2″ piece of Whisper White card stock. 3. Top Layer: Melon Mambo card stock but to 3 5/8″ x 2 5/8″ layered with a piece of Whisper White cut to 3 1/2″ x 2 1/2″. The Lady is stamped with Basic Black Archival ink on the Whisper White and again on the Pop of Pink DSP with the polka dot design. You cut out just inside the lines of the dress on the Designer paper and attach that to your card. The hat is stamped on a scrap of Melon Mambo card stock, cut out and layered onto the card. Then “Celebrate…” is stamped on the bottom. This layer is attached with dimensionals on an angle to the card. I used Basic Gray card stock for my card base. Then I layered a piece of the Herringbone striped paper from the Pop of Pink Designer paper pack. This layer is cut to 4″ x 5 1/4″. Next is a piece of Melon Mambo card stock and a layer of the white and triangle design Pop of Pink DSP. 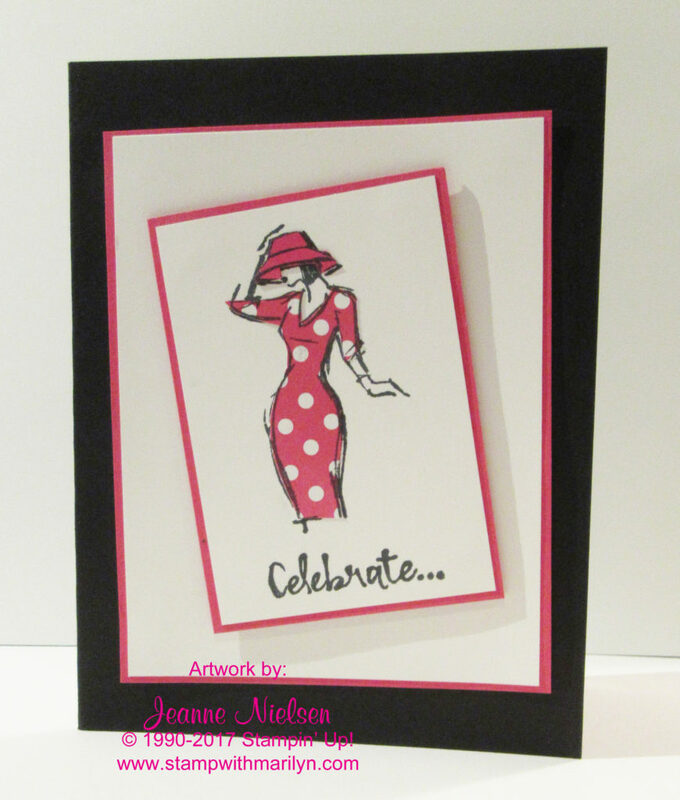 Last I stamped the lady on the small polka dot pattern of the DSP and the hat on a scrap of Melon Mambo cardstock. NOTE: Stampin’ Up!’s paper snips are a must for making this card with all the fine detailed cutting. This technique is called Paper piecing since you are cutting the images out and piecing them together. 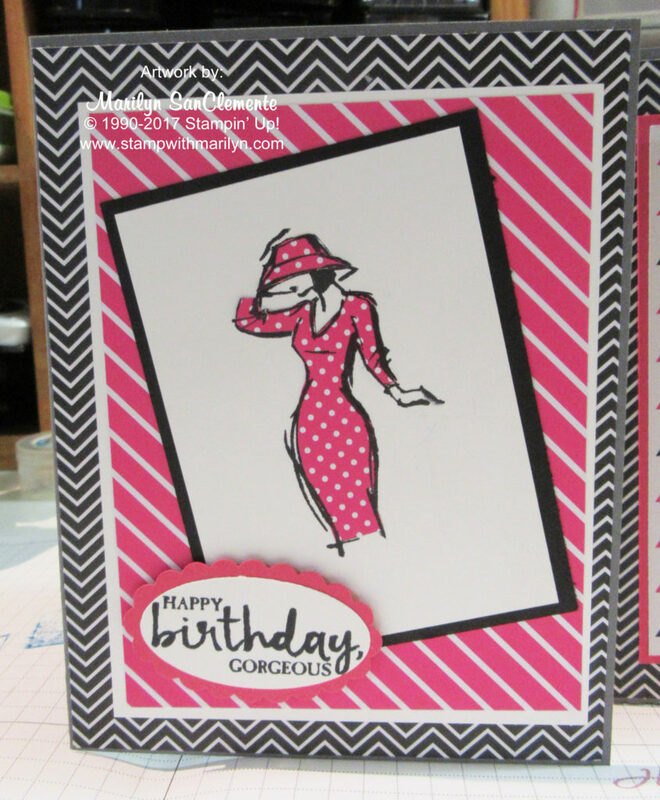 She also used the Basic Gray cardstock and the Herringbone pattern for her card base. She changed the second layer to a piece of Whisper White since she chose a very strong Melon Mambo patterned diagonal Stripped paper for her 2nd layer. The third layer is a piece of Basic Black cardstock which I think makes the herringbone pattern stand out a little more. She stamped her message on a separate piece of Whisper White cardstock. She cut the message out with the small oval framelit and then cut a layer out of Melon Mambo with the Scalloped oval framelit. She used a dimensional so the message pops!